Tokyo Police Club have had the good fortune of garnering so much attention with the release of their debut EP, A Lesson In Crime. And with each release it seemed as more and more people were becoming familiar with this young Canadian quartet. Each release found the band finding a more matured controlled sound that relied heavily on catchy melodies and sing along choruses. Since the release of their most popular album, Champ, we find Tokyo Police Club daring to be different again and not shying away from the unconventional. Forcefield starts with the epic sounds of “Argentina Pt. I, II, & III” an eight minute song the travels through all the different tone and moods Tokyo Police Club are capable of creating. “Gonna Be Ready” and “Beaches” sees the band incorporating more influences into their songs. “Gonna Be Ready” with it’s explosive fury of a chorus and “Beaches” showing their urge to influence the listener to dance. Then “Toy Guns” follows leaving the listener questioning whether they were listening to the same band. 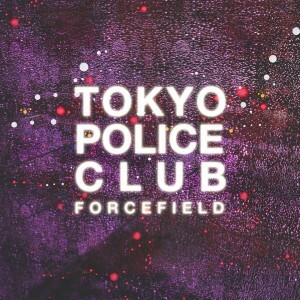 Luckily, the rest of the songs on the album follow the recipe that made Tokyo Police Club a stand out band to begin with. An encouraging effort from a band is still capable of crafting remarkably strong indie rock songs, let’s hope we don’t have to wait another four years for another album.